Thai artist Thitirat Saybua Saybua, the one behind the world of JellyMew. สายบัว Thitirat Saybua is all set to make one of her biggest releases this coming Sunday. 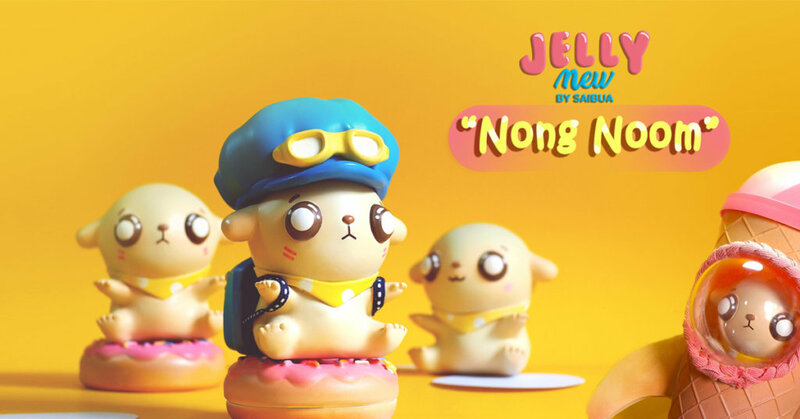 Nong Noom JellyMew prototype was on display at last months ATM 4 show and collectors have been waiting to get their hands on one. Who’s ready for a sugar-fueled adventure and keeping “Nong Noom” company. Oh, Nong Noom eyes and expression! or lack of expression. Like the Thai’s type 555555 Nong Noom ticks our cuteness boxes. The set includes Nong Noom figure, hat, bag and glasses. Time to set your alarm and mark your calender if you are ready to join Nong Noom on his adventure. “Nong Noom” A little sugar rocket, he comes from the outer space. Many fake friends don’t like him, because he was born without a tail. Now he’s looking for a compaion to travel together. 23rd September 2018 at 8.00PM Thailand time new image will appear via Saybua’s Facebook and Instagram. Comment with “1 Nong Noom ” under the latest photo at the set time and date.